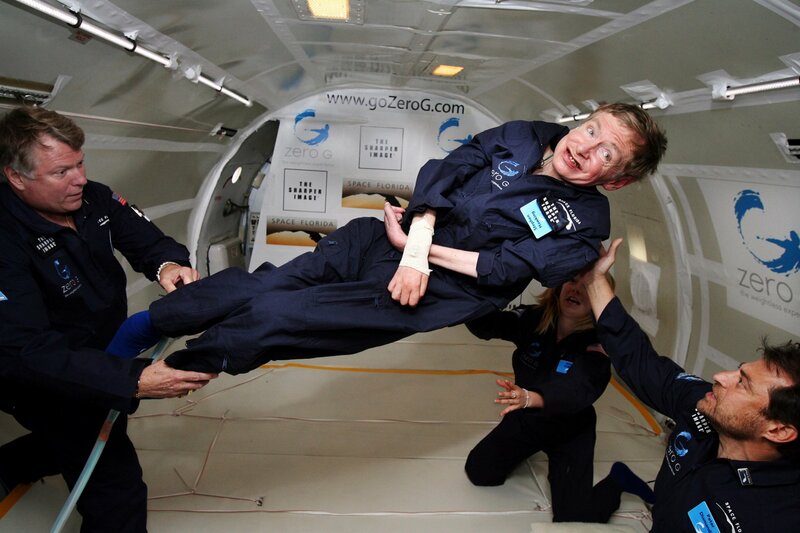 As part of his Ph.D. thesis in 1966, Dr. Hawking showed that when you ran the film of the expanding universe backward, you would find that such a singularity had to have existed sometime in cosmic history; space and time, that is, must have had a beginning. He, Dr. Penrose and a rotating cast of colleagues went on to publish a series of theorems about the behavior of black holes and the dire fate of anything caught in them. It also meant that black holes had a temperature and had entropy. In thermodynamics, entropy is a measure of wasted heat. But it is also a measure of the amount of information — the number of bits — needed to describe what is in a black hole. Curiously, the number of bits is proportional to the black hole’s surface area, not its volume, meaning that the amount of information you could stuff into a black hole is limited by its area, not, as one might naïvely think, its volume. In 1974, Dr. Hawking was elected a Fellow of the Royal Society, the world’s oldest scientific organization; in 1982, he was appointed to the Lucasian Chair of Mathematics at Cambridge, a post once held by Isaac Newton. “They say it’s Newton’s chair, but obviously it’s been changed,” he liked to quip. In a meeting at the Vatican in 1982, he suggested that in the final theory there should be no place or time when the laws broke down, even at the beginning. He called the notion the “no boundary” proposal. It appeared for a time that he would be able to communicate only by pointing at individual letters on an alphabet board. But when a computer expert, Walter Woltosz, heard about Dr. Hawking’s condition, he offered him a program he had written called Equalizer. By clicking a switch with his still-functioning fingers, Dr. Hawking was able to browse through menus that contained all the letters and more than 2,500 words. Although he averaged fewer than 15 words per minute, Dr. Hawking found he could speak through the computer better than he had before losing his voice. His only complaint, he confided, was that the speech synthesizer, manufactured in California, had given him an American accent. He also hoped to earn enough money to pay for his children’s education. He did. The book’s extraordinary success made him wealthy, a hero to disabled people everywhere and even more famous. In 2004, British newspapers reported that the Cambridge police were investigating allegations that Elaine had abused Dr. Hawking, but no charges were filed, and Dr. Hawking denied the accusations. They agreed to divorce in 2006.